Catholic press; confessors; deaf people; educators; writers; journalists Bishop of Geneva, Doctor of the Universal Church; born at Thorens, in the Duchy of Savoy, 21 August, 1567; died at Lyons, 28 December, 1622. His father, Francois de Sales de Boisy, and his mother, Francoise de Sionnaz, belonged to old Savoyard aristocratic families. The future saint was the eldest of six brothers. His father intended him for the magistracy and sent him at an early age to the colleges of La Roche and Annecy. From 1583 till 1588 he studied rhetoric and humanities at the college of Clermont, Paris, under the care of the Jesuits. While there he began a course of theology. After a terrible and prolonged temptation to despair, caused by the discussions of the theologians of the day on the question of predestination, from which he was suddenly freed as he knelt before a miraculous image of Our Lady at St. Etienne-des-Gres, he made a vow of chastity and consecrated himself to the Blessed Virgin Mary. In 1588 he studied law at Padua, where the Jesuit Father Possevin was his spiritual director. He received his diploma of doctorate from the famous Pancirola in 1592. Having been admitted as a lawyer before the senate of Chambery, he was about to be appointed senator. His father had selected one of the noblest heiresses of Savoy to be the partner of his future life, but Francis declared his intention of embracing the ecclesiastical life. A sharp struggle ensued. His father would not consent to see his expectations thwarted. Then Claude de Granier, Bishop of Geneva, obtained for Francis, on his own initiative, the position of Provost of the Chapter of Geneva, a post in the patronage of the pope. It was the highest office in the diocese, M. de Boisy yielded and Francis received Holy Orders (1593). The following is a list of the principal works of the holy Doctor: (1) "Controversies", leaflets which the zealous missioner scattered among the inhabitants of Le Chablais in the beginning, when t hese people did not venture to come and hear him preach. They form a complete proof of the Catholic Faith. In the first part, the author defends the authority of the Church, and in the second and third parts, the rules of faith, which were not observed by the heretical ministers. The primacy of St. Peter is amply vindicated. (2) "Defense of the Standard of the Cross", a demonstration of the virtue of the True Cross; of the Crucifix; of the Sign of the Cross; an explanation of the Veneration of the Cross. (3) "An Introduction to the Devout Life", a work intended to lead "Philothea", the soul living in the world, into the paths of devotion, that is to say, of true and solid piety. Every one should strive to become pious, and "it is an error, it is even a heresy", to hold that piety is incompatible with any state of life. In the first part the author helps the soul to free itself from all inclination to, or affection for, sin; in the second, he teaches it how to be united to God by prayer and the sacraments; in the third, he exercises it in the practice of virtue; in the fourth, he strengthens it against temptation; in the fifth, he teaches it how to form its resolutions and to persevere. The "Introduction", which is a masterpiece of psychology, practical morality, and common sense, was translated into nearly every language even in the lifetime of the author, and it has since gone through innumerable editions. 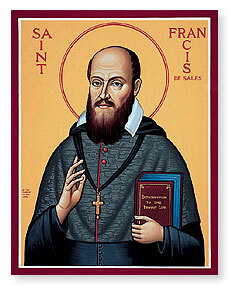 (4) "Treatise on the Love of God", an authoritative work which reflects perfectly the mind and heart of Francis de Sales as a great genius and a great saint. It contains twelve books. The first four give us a history, or rather explain the theory, of Divine love, its birth in the soul, its growth, its perfection, and its decay and annihilation; the fifth book shows that this love is twofold—the love of complacency and the love of benevolence; the sixth and seventh treat of <affective> love, which is practised in prayer; the eight and ninth deal with <effective> love, that is, conformity to the will of God, and submission to His good pleasure. The last three resume what has preceded and teach how to apply practically the lessons taught therein. (5) "Spiritual Conferences"; familiar conversations on religious virtues addressed to the sisters of the Visitation and collected by them. We find in them that practical common sense, keenness of perception and delicacy of feeling which were characteristic of the kind-hearted and energetic Saint. (6) "Sermons".—These are divided into two classes: those composed previously to his consecration as a bishop, and which he himself wrote out in full; and the discourses he delivered when a bishop, of which, as a rule, only outlines and synopses have been preserved. Some of the latter, however, were taken down < in extenso> by his hearers. Pius IX, in his Bull proclaiming him Doctor of the Church calls the Saint "The Master and Restorer of Sacred Eloquence". He is one of those who at the beginning of the seventeenth century formed the beautiful French language; he foreshadows and prepares the way for the great sacred orators about to appear. He speaks simply, naturally, and from his heart. To speak well we need only love well, was his maxim. His mind was imbued with the Holy Writings, which he comments, and explains, and applies practically with no less accuracy than grace. (7) "Letters", mostly letters of direction, in which the minister of God effaces himself and teaches the soul to listen to God, the only true director. The advice given is suited to all the circumstances and necessities of life and to all persons of good will. While trying to efface his own personality in these letters, the saint makes himself known to us and unconsciously discovers to us the treasures of his soul. (8) A large number of very precious treatises or opuscula.